Odoo POS can be set-up in minutes to enable you to sell in seconds and it is compatible with any Device. 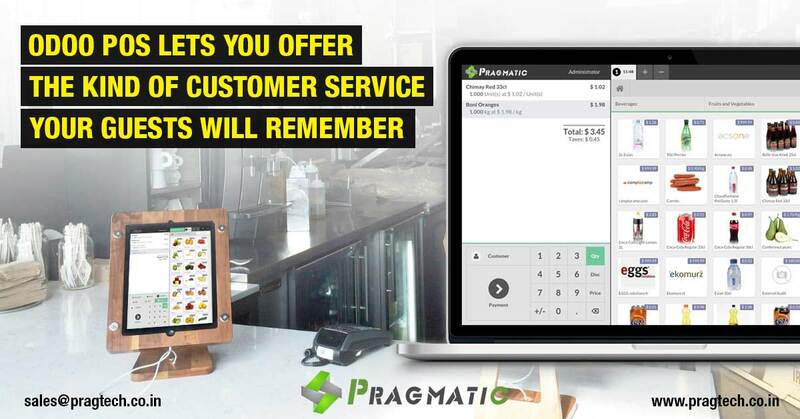 Without any complex configuration, Odoo POS is easy to install and use, with its user friendly, beautiful and responsive interface, which work flawlessly and effortlessly with desktops, iPads & android tablets. Also let them coming back with amazing loyalty programs. Reward your Guests with points, gifts and discounts with Odoo loyalty programs. The whole process is fast and can be entirely automated. Identifying your customers is even faster with loyalty cards and customer barcode ids. Register your customers to keep track of their buying habits. You can then send them special offers and sale notices with Odoo Mailing. Register tax identifications for your business customers and give them invoices instantly (or send by email). With Odoo, you get a 360 degree customer view, including cross-channel sales, interaction history, profiles and more. Online or offline – Odoo’s Point of Sale stays reliable even if your connection is not. Set up new stores quickly and easily with just an internet connection. Then use your Point of Sale everywhere, anytime. While an internet connection is required to start the Point of Sale, it will stay operational even after complete disconnection. Integrated Inventory Management – Real time control & accurate forecasts to manage procurements. Odoo Inventory app automatically inputs any transaction from the POS in the stock. You can see in real time the availability of products without losing time. Furthermore, the POS is compatible with Odoo eCommerce. You won’t need to set up separate stocks for the two apps and be a truly multi-channel business, without headache. Give your guests an environmentally friendly option by offering to email them a bill instead of printing it. Still need paper ? Odoo POS integrates with a number of industry standard printers and peripherals for easy printing of a bill after a purchase. Customize floor plans for your restaurant – A complete solution to manage bars and restaurant. Create a floor layout that matches your restaurant seating. Need to quickly move some tables around? It’s as easy as swiping. Insider Odoo POS, you can create or manage your floor plans, positioning tables on POS screen by simply drag & drop and create a replica of the actual floor plan of your restaurant. New orders and updates can be sent to the kitchen or bar as soon as you encode them. The order instructions are automatically sent to the correct printer based on the menu item category.